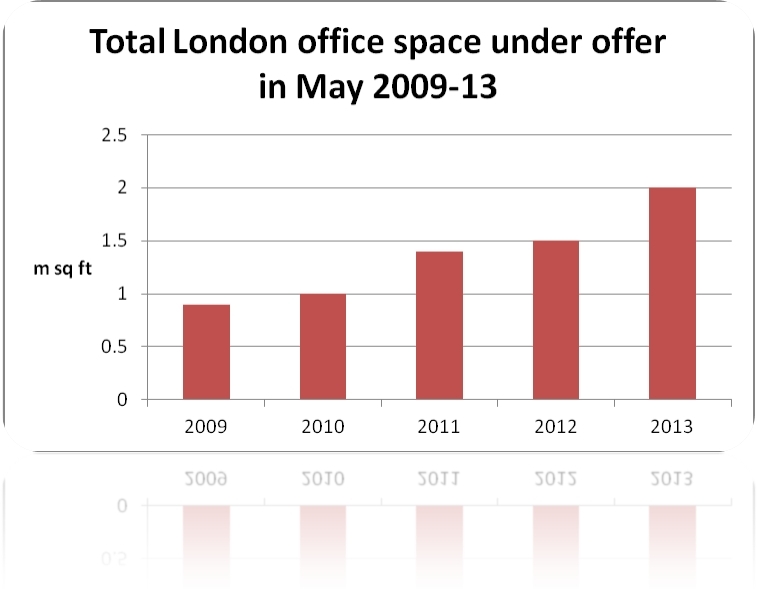 Demand for Central London office space is looking up. 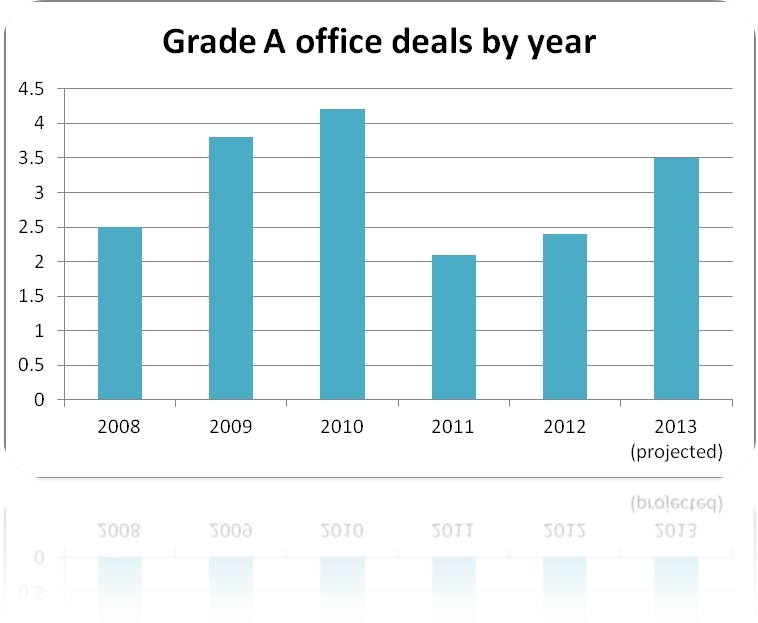 In the first half of the year office take-up reached over 900,000 sq ft. Recent well publicised deals involving Amazon, WorldPay, Saatchi & Saatchi and Bird & Bird look likely to push office take-up in the second quarter to in excess of 2.6m sq ft. There is over 2m sq ft ‘under offer’ in central London, which will form the backbone of Q3 take-up. The reasons for the upsurge in demand in London include a bulge of lease expiries in the 2014-16 period, an upturn in the fortunes of the financial services sector in London and a rapidly widening choice of new office space available for letting. Financial services is currently taking around 10% of central London take-up, compared to only 6.5% in the same quarter in 2012. While some of this demand is coming from banks, mainly overseas owned merchant banks, the majority of financial services sector demand is being driven by derivatives traders, private equity advisers, transaction groups and fund managers. There are 86 office schemes under construction at the moment in the main London office districts with 8.5m sq ft of office space available for letting. In addition, a further 21 schemes have completed since late 2012, offering more than another 1m sq ft for letting. Agents estimate that over 80% of office space available in central London is grade A. Meanwhile, prime office rents are only 1% above the level of a year ago, with low rental growth particularly apparent in the City of London, which is further encouraging companies approaching lease expiries to consider moving to new buildings. In terms of future demand, Metropolis is currently tracking just over 600 medium and large central London office requirements in the market, equivalent to 12m sq ft of demand. In addition, there is a similar number of instances where companies are approaching lease expiries in the next two years and have not yet decided whether to move or renew. Deals which result from these decisions could result in a further 18m sq ft of transactions over the next two years. 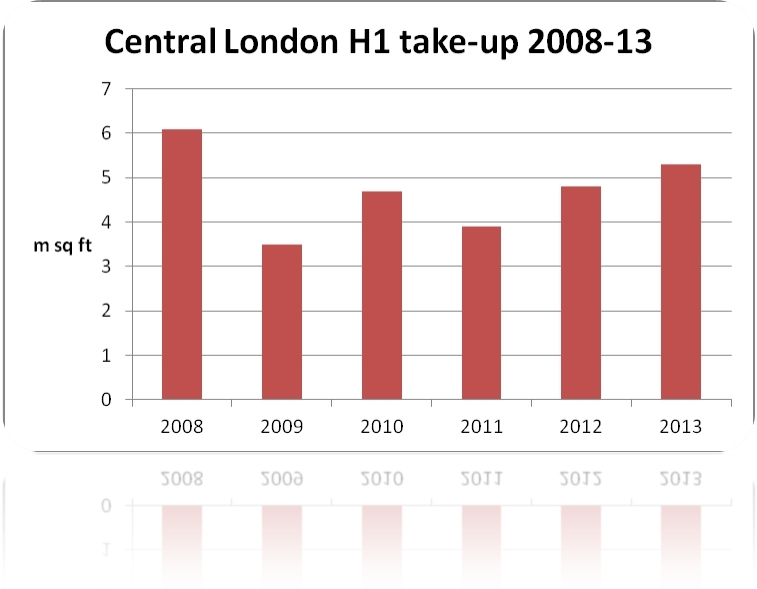 The current increased level of take-up means that there is a real prospect that office lettings in central London in 2013 could top 10m sq ft for the first time since 2010.